I never liked boxing. I still don’t but my parents were hooked onto it. When the forthcoming fights were announced, they would make sure they were home early from work, giving themselves enough time to get the meals for my brothers and I. Once that was done, we were put to bed promptly and out of the way. When the fight began, nothing could interrupt. From my bedroom, I would hear shouts and screams from my parents, which I imagined occurred towards the end of the fight or when someone had been knocked out. My brother’s held a mild interest but Muhammad Ali only came alive for me when I watched him being interviewed. I was intrigued, I was shocked and I was fascinated. Here was a black man who showed confidence, perhaps arrogance. I didn’t understand it! How on earth could he like that? Why did he not show fear? This high-esteem was something I had never seen before. It was self-actualisation at its best. Added to all that, he was full of clever witticisms and impassioned by injustices dished out to his community. I remember watching him being interviewed by the British interviewer Michael Parkinson. He passionately articulated the problems experienced by the black community. It was an awakening for me; it also illustrated and answered questions about the racism I experienced in London. The other incredible thing was his refusal to participate in the Vietnam War. Wow, was I transfixed. This was somebody who was able to say No, without any difficulty. He had the courage to use when necessary, and used it as a safeguard against mistreatment. Hearing him resist war, racism and injustice, it was refreshingly cathartic. My fascination with Ali, stayed with me. Years later, whilst at school, I would visit a popular black bookshop called Headstart, where I came across books about Martin Luther King jr, Bobby Seales, Angela Davis, George Jackson and of course, Malcolm X.
Ali was not just important because of his boxing but of his impassioned commitment to racial injustice; his outspoken views made him unpopular with the press, liberals and the right-wing alike; even the Civil Rights establishment did not forgive him for being a member of the Nation of Islam, and of course, his loathing of Lyndon Johnson’s war. While being surrounded by this sea of resentment, he remained true to himself. 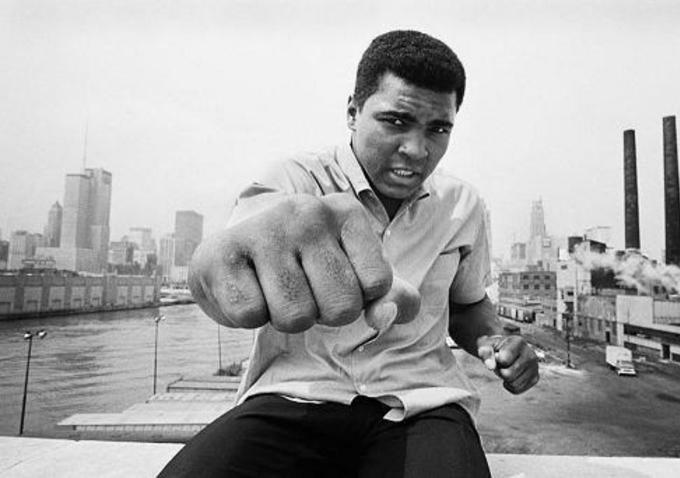 I will always be grateful for the presence of Muhammad Ali, of what he gave to the black consciousness movement, and eventually gave to everyone. Parkinson disease is a cruel disease which does not discriminate, and it took away Life’s favourite son. My heart and prayers are with his family, and I ask that God rest his soul in eternal peace.